The installation of applications can be automated as part of a Lite-Touch deployment. There are times when you want to install an application after the operating system has been deployed. For example you may want to install an antivirus client or an SCCM client agent. Firstly your applications will need to be added to the deployment workbench and configured to run silently. Once that’s done you can target the applications by obtaining their GUID’s from the Applications node. You should list all your applications in the order that you want them installed (for example, Applications001, Applications002, Applications002 etc). followed by their GUID in curly brackets. If you have many applications to automate, you can save time and obtain the GUIDs from the Applications.xml file in the Control folder of your deployment share. 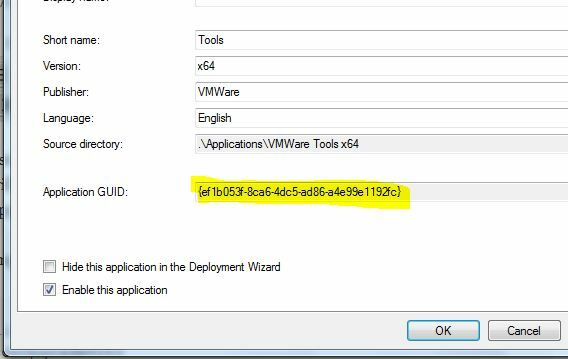 You may not want your applications to install for every single task sequence in which case you can add the variables as Task Sequences Variables. More on that another day. This entry was posted in Deployment, MDT 2010 and tagged customsettings.ini, Lite Touch, MDT 2010, Vista, Windows 7, Windows 7 Deployment, Zero Touch. Bookmark the permalink. I got an issue with that. I listet all apps I need to get installed automaticaly, just like shown here, but they just not getting installed. and this way the wizard shows me the apps, but they all are already selected, so I can go ahead and click next. But still, they are not getting installed. I wonder why! I would take a look at your applications themselves as the wizard is a simple beast that only leverage’s what has been configured. Many thanks for posting this guide, which allowed me to do all I needed. I had AdobeFlash, AdobeReader, AdobeShockwave and Java installed within the hour. Just working on AdobeAir now…. Once again, thank you for this blog, it has lot of good information. I was looking for an article to deploy apps based on Task Sequence. Did you or would you be able to elaborate on “add the variables as Task Sequences Variables”? It could be any number of things Jason. Post this in the MDT forum and I’ll help answer it there. Hi Scriptimus, thanks, now i resolve the issue. It sounds like you’re not using the correct task sequence. You should use standard client task sequence. haha yeah, i’m using post task sequence, but this is because there are in the server another process of personalization thorugh another tool, then we don’t using the standard client task sequence. I take this opportunity to ask you another question. I happen substituting a .dll file extension. For this I was trying to use robocopy, xcopy, copy and script in Visual Basic (VBS) but does not work me, at the end of the execution of the task sequence, it appears that it has not been successful and that the file is not found . The curious thing is that I’m using to replace other folders and works successfully. Do you have any idea about what is wrong? I’ve really been experiencing several problems with this. I am in the process of customizing a Windows Server 2003 with MDT 2012. Another problem that I currently happening is the following: I am running over the task of configuring network adapters. In this way I establish the name of the adapters only. For some reason the company requires that the name of the adapters carry accents. When the sequence task executes, puts the names but gets bad because there is an issue of characters not supported. What I did then was to create a script in order to put the names with accents and running smoothly. But when this happens, the driver of one of the adapters makes the connection preventing crash recognition, and must be restarted for the driver and connection work is recognized. Do you have any idea that it could be what is causing this type of behavior? I also want to share and know your opinion. I am running few scripts end with diskpart to set a mirror between two hard drives, but at the end of an error notice always appears he could not access certain files and is set to 70%. Ideal set up a mirror in MDT with diskpart or is there a better way? Wow. You have a lot of issues to work through. I suggest starting a chain for each one in the MDT forum. The link is on my contacts page. I will help where I can. I’ll do that. Thanks in advance bro.